American Express Business Gold Rewards 75,000 Bonus Offer - How to Get It! Amex Business Gold Rewards 75k Bonus & No Annual Fee – I Got It & You Can Too! Miles to Memories does not have a direct relationship with the card issuing bank(s) and this post does not include any affiliate links. If you wish to support the site by applying for credit cards or using other referral links, you can do so here. Before applying I highly suggest reading the following posts: Slow & Steady Doesn't Make You A Loser and A Mandatory Waiting Period to Apply for Credit Cards?. You can find all of our credit card reviews here. A couple of weeks ago a friend alerted me to a somewhat targeted 75k bonus sign-up offer for the American Express Business Gold Rewards card. I believe the first person to post about this offer was PointsCentric. To get the offer, you have to visit this link. The thing is depending on your browser & privacy settings, you may get the standard 25,000 public bonus offer, a 50,000 point bonus offer or the coveted 75,000 bonus offer. Each of the three offers differs slightly, so lets take a look at them. I held off on writing about this offer until I was able to replicate the deal. Over the course of several days I used Chrome, Firefox & Internet Explorer in both regular and private modes. Additionally I used mobile Safari and mobile Chrome in all modes and the best I could get was the 50,000 point offer. This is the full offer screen. It probably took me over 100 loads over a couple of days before I finally got the 75,000 bonus offer to load. In the end I was able to get it to load by using desktop Chrome in Incognito Mode. I had tried to load it probably a dozen times before in Chrome Incognito, so it won’t work every time. I do believe if you keep trying different browsers and configurations the deal will eventually show up. It may take some persistence, but it should appear eventually. Other people have had success getting it to load with Chrome on Android in Incognito & iPhone Safari Private mode. You may be able to get them to honor it over the phone as well by calling and telling them you saw the offer online. $0 introductory annual fee for Additional Business Gold Rewards Cards in the first year; then, $50 for the first Additional Business Gold Rewards Card and no fee for other Additional Cards. 3x points on airfare purchased directly from airlines. 2x points on US purchases for advertising in select media, shipping, at gas stations, and made directly from select computer hardware, software, and cloud computing providers. You can find the full terms and card benefits on the application page. The bonus amount shows up on the application page as well. I have previously only seen this card with a 75k bonus once before. Historically this is the best that it gets and unlike the various 100k Platinum card offers, the annual fee is waived the first year. 75,000 Membership Rewards points are probably worth $1,200 to $1,500 depending on how you value them. As you can see above, the 75k offer does require $10k in spending compared to $5k for the other offers. While that is a lot of spending, I think it is worth it based on the overall bonus amount. 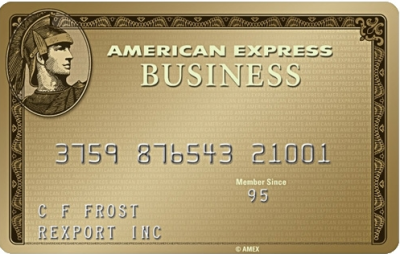 The American Express Business Gold Rewards card isn’t great for everyday spending. It does earn 2x Membership Rewards points at gas stations and 3x points when booking airfare directly with an airline. For that reason it may be good for some. Keep in mind that American Express business cards aren’t held to the once per lifetime bonus like the personal cards. If you haven’t had this card active in the past 12 months you can get this bonus per the terms. Hopefully many of you will be able to get this deal if you think it will be of benefit to you. Like I said, if you don’t get the offer to load the first or twentieth time, keep trying. It took me many many tries over several days before I was able to get it to load. I personally applied for the card and was approved a couple of days ago. While I wish I had been able to get this card approved before Small Business Saturday, I am happy with the bonus and will have it available as part of my arsenal for Amex Offers this holidays season. Good luck! Next articleDeep Discounts – Up to 50% Off Gift Cards at Toys R Us, Whole Foods, Staples, Sephora & More! Can you apply for it if you do not have a business? You do need a business, but you are able to use your social security number to apply if it is a sole proprietorship. There are a lot of definitions as to what constitutes a business. On the application they will ask for business revenue, but you also have a place to put your personal income. Even if the business doesn’t have a lot of revenue, you may be able to qualify. So yes you need a business, but it doesn’t necessarily have to be one that has a lot of revenue. I know some people have used eBay businesses and other similar ventures to apply for business credit cards in the past. The important thing in my opinion is not to lie on the application. Shawn (and John) – unfortunately I just found that this 75k offer (only took me about 20 times refreshing) requires that the business be a “corporation” or “partnership” (some apps I’ve seen don’t specify and/or allow “sole proprietorship” ) AND that you have a different SSN and EIN (business tax ID number). It doesn’t require you be a corporation. I applied and was approved as a sole proprietor with only my SS#. It will ask what type of business you are. If you select sole proprietor, it allows only your social. If you select corporation or partnership then an EIN is required. Maybe I’ll try it again. But I am certain that the form I got (for the 75k option) ONLY had “corporation” or “partnership” as the two options (had to choose one of those two specifically). I tried to roll with partnership, but that required an EIN (and got error message saying it must be different than SSN). Will be interested to see if anyone (from here forward) gets the 75k offer with “sole proprietorship” as an option. I would try again. I just got the 75k offer to come up again and verified it did have the “Sole Proprietor” option. I have sent you a screenshot! Good luck. Glad I tried again. The sole proprietorship option was there this time (definitely was not the first time). I did run into a “pending” review – probably due to my personal business operations being fairly small. But hopefully I’ll get approval with a phone call tomorrow. Thanks again! Forgive me if I missed this in my first scan (in a rush at the moment!). But I don’t think you list what the annual fee is after the first year? Thanks for catching that. It is $175 after the first year and $50 for the 1st AU card. I have updated the post. Christmas came early to us this season. Spent some time last night refreshing the screen on Chrome. Finally got it. 75k/Screen shot/ apply/approve. Also my husband got approved for the 100k Amex Plat thanks to Gary’s mention of Ralph’s blog. Thanks PointCentric. Off to generate 20k spend in the next 90 days. I was able to get it (75,000 pt offer) on Chrome Incognito first try. Didn’t work on Firefox (50K offer). Anyway, almost instant approval. Thanks! Wow. That is great! Congratulations. I had no luck on the browser trick. Best luck I had was 50k. So, I cleared my cookies and went to Americanexpress.com to login my account and, just for grins, compared cards. Lo and behold, the 75k offer to add a gold card account. I saved the screenshot, applied and got approved for it! Thanks for the tip! It took about four different load attempts and eventually using Incognito on Chrome to see the 75,000 offer. I signed up on Other business in order to see Sole Proprietorship. I submitted and got the Pending Review notice. No reference number, just a number to call. The basic AMEX number, as it turns out. Which demanded repeatedly to know my Amex card number to proceed. I finally pushed past this by repeatedly saying “representative” to every prompt. I waited on hold for ten minutes. Then an email came through: Approved. I hung up. For some reason it isn’t instantly approving people. When I applied, it gave me the pending message. I went to americanexpress.com/applicationstatus two minutes later to check the status and I was approved. It seems there is a couple of minute delay on the approval. Congratulations! I have the old regular AMEX Gold card with a $125 annual fee that only earns 1point/dollar across the board. I received a letter recently telling me I would be switched to the PWG card with the higher renewal rate and the benefits that come with it. My question is, If I apply for this card, will AMEX consider me to already have the PWG card under my circumstances? The terms say, “Welcome bonus offer not available to applicants who have or have had this product within the last 12 months.” I would call American Express up to see if they consider it the same product. I do believe it is a separate product, but I would call them up for confirmation before applying. I was able to get the 75K to pop up using Chrome incognito after about 15+ page refreshes. Great post, Shawn. I got the offer after about 10 tries. Have you seen any great offers for the Amex Platinum card? I’m looking to get that card and maximize the $200 travel credit before the end of 2014. Thanks! Received the card today. I really do love American Express. They Fed Ex out those higher end cards to your door in 2-3 days. One of the things I noted was a little flyer in the materials that said that, starting Jan 31, 2015, instead of x3 airlines, you can choose one category among five options to be x3 MR points – airlines, gas stations, shipping, advertising, or select software/hardware sales – with the rest x2. All I can say is, x3 MRs at gas stations is going to be AWESOME.